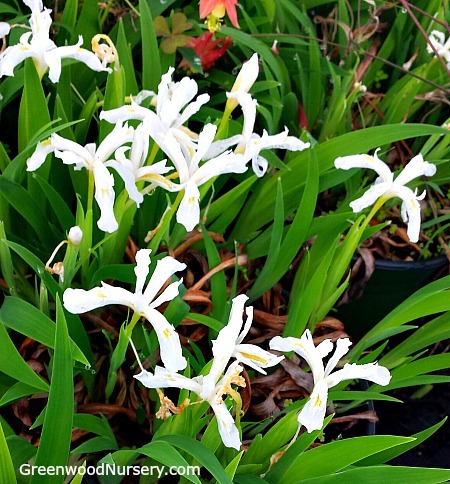 Commonly referred to as the dwarf white crested iris, this is a herbaceous, native shade-loving perennial. It is characterized by pure white flowers with gold crested falls on an extremely short stem. It often appears to be stemless. The sword-shaped, narrow leaves are yellowish green to pale green and rise form branching rhizomes. The dwarf white crested iris spreads aggressively often forming dense colonies if provided with optimum growing conditions. It blooms many flowers from mid-April to May and requires medium watering and fertile hummus-rich, well drained soils to thrive. They are propagated from rhizomes so you will get the added benefit of dividing them for more blooms. When planting, space the plants 12” apart to give room for spreading. They grow to a short height of just 6”. In the wild, they may be found along river banks and among moisture loving plants such as tall marsh grasses. The White Tennessee Iris is excellent for planting in a shady rock or woodland garden. It may also be used as a border plant or as seasonal ground cover and edging. They attract snails and slugs, so this maybe a problem for some people but you can easily solve this using slug traps or citrus peels. They are also deer-resistant and an excellent source of nectar attracting bees and butterflies. Improve your wildflower garden with the Iris Cristata which will give a wonderful variation of height and give burst or color contrast with the white and gold flowers set in a backdrop of lush green foliage. It shows in late spring and lasts longer than most flowers making it an excellent choice for pairing with most short blooming varieties. We offer the Dwarf Crested Iris for sale here at GreenwoodNursery.com. TN White Iris is grown in one gallon containers. Orders shipping to CA or AZ may be bare rooted before being prepped for shipping.